“Whoop whoop” as Vicky herself might say. She’s always whooping. Our great friend Vicky Loras, she’s so friendly, and helpful and diligent. We Skyped a few times as the language plant evolved and took shape, finally settling on one big red verb, “didaksa” which means “I taught”, and “didaksame”, “we taught”, as it’s all about her time in Greece teaching in her own school, The Loras English Academy with her two sisters Eugenia and Christine. I suppose it’s best to describe her as Greek Canadian. She and her family moved back to Greece when she was just a sweet little girl of 8, so she of course speaks fluent Greek. Now she’s loving her time in Switzerland, teaching mainly business English and, despite the butterflies in her tummy, giving teacher training seminars at conferences. We wrote the plant using the Latin alphabet to help show some Ancient Greek words that sneaked into English centuries ago: micro-, mega -, didactic, and scholio. And on behalf of all of you, I thank Vicky sincerely for her generously clear pronunciation on the video below. She actually makes me believe I can speak Greek! Now that deserves a whoop whoop! This is so cool. Don’t know that I’d ever heard greek slowly enough to appreciate it, WHILE it was been explained to me. Oh I wish there was more time to learn all these beaUUUUtiful languages. Merci David and Vicky ! Cheers Brad. Us mere mortals need to hear it nice and slow. Thank you so much for giving me this opportunity to take part in a language plant. I absolutely love how it turned out and thank you for your wonderful words at the beginning. It was a great pleasure to work with you on this! I have my mom to thank for teaching me Greek. I also went to Greek school in Canada every Saturday, but without mom’s patience and persistence I would never have learnt the language. This is the exact way he would repeat phrases to us, so it was very moving for me yesterday. Whoop whoop Vicky!! Thank you for your involvement, great to make such a nice piece of work together. loved the sounds, what a beautiful voice! It is indeed omorfi 🙂 Thanks for commenting, Ceri, let’s do yours proud too. Absolutely wonderful David and Vicky! 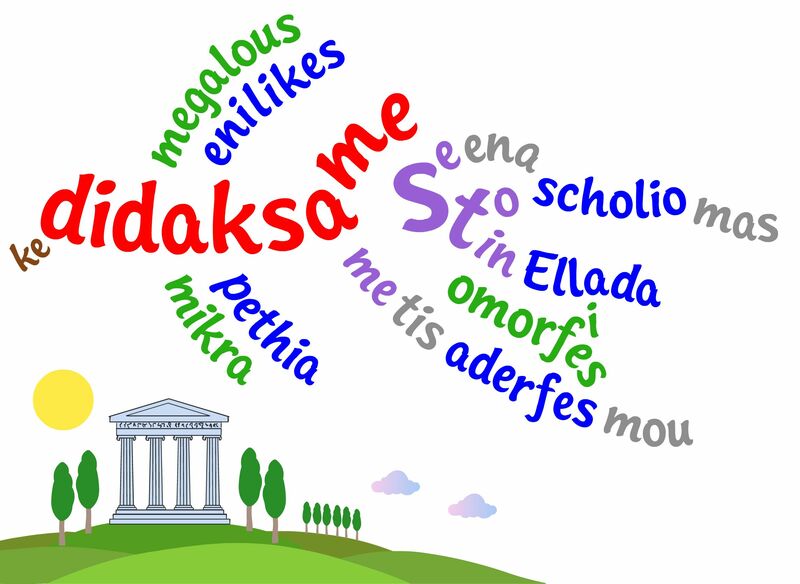 I omorfi Ellada mas (Our beautiful Greece) has its very own language plant lesson! I’d love to see plants from other languages too! Thanks Dina!! Welsh is next, i omorfi Ceri mas is helping me. It will be wonderful to see which languages are next. Well done, David & Vicky! Na doume polla omorfa φυτα sto kipo sas! Looking forward to seeing your plants grow! Efcharistoume poli for your omorfo comment, Julie! You are currently reading Whoop Whoop, Greek Lesson #1 at language garden.